Look at me... Spaghetti is good! especially with the sauce mommy makes - I just love it. 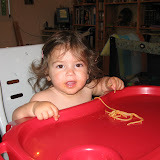 We sat to eat at the table and daddy decided to give me some spaghetti which I never succeeded in eating before, I gave it another try and now I can.